Not only does the new year mean a new you but it also means it’s time to get a start on your wedding planning! 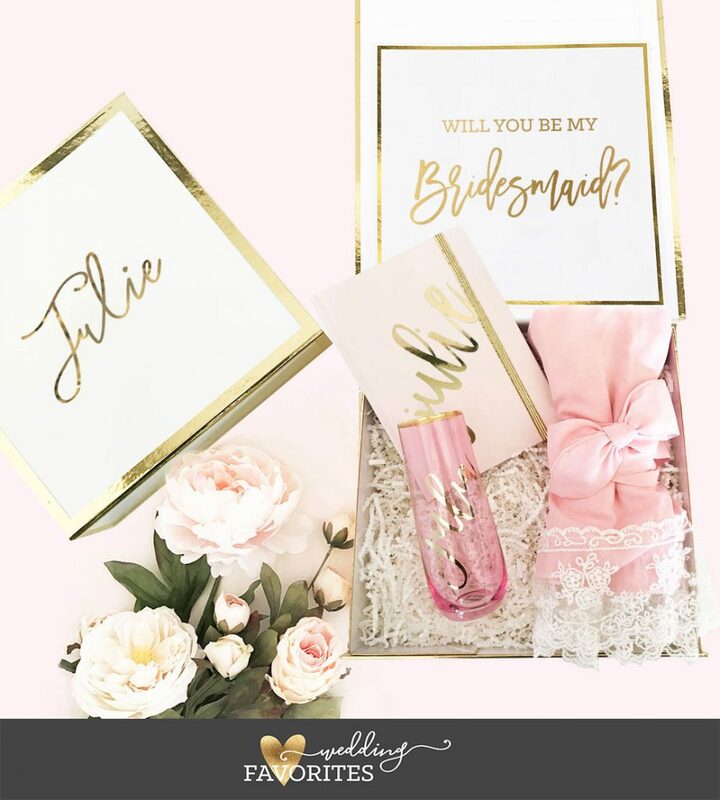 To help ease some of the planning stress, we’ve made a handy shopping guide to our most popular gifts your future bridesmaids will love and cherish. Read below to find out more. You can’t start the gift hunt without the perfect package, so why settle for regular gift boxes when you can add your own personal flair! 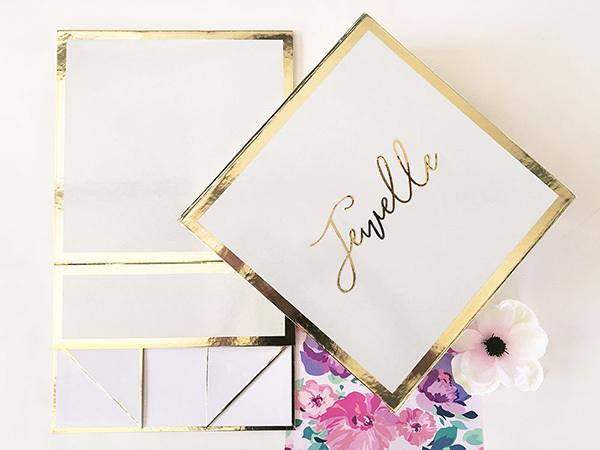 These adorable gift boxes come personalized with the name of your choice in a beautiful gold vinyl and can double as a keepsake box. Choose to add a card on the inside to either thank or ask your bridal party. Additionally, you can add paper shred to fill in the box for an additional charge. You can find many unique gifts to fill your boxes with including personalized tumblers, ring dishes, sunglasses, bracelets, shirts, and more! 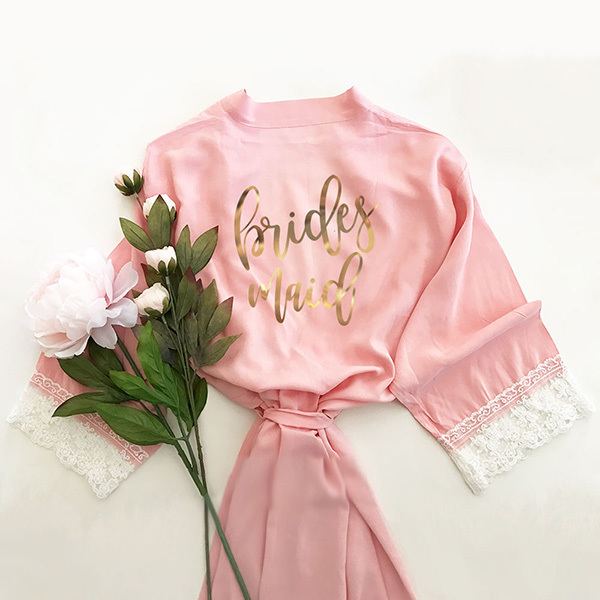 Your bridesmaids will fall in love with these delicate soft robes! Have the bridal party role printed in metallic gold on one of our five beautiful color options, sure to match your wedding theme! Have flower girls in your bridal party? No worries! We also have flower girl robes available in a beautiful blush. Furthermore, they make a perfect addition to getting ready photos or in a thank you gift box. For a stylish look, roll them up and tie a beautiful bow with the matching belt included with the robe. Quick tip, to get wrinkles out simply iron or steam them on low heat and they’ll be good to go! Pretty journals make stylish and practical gifts your girls will surely love! Personalized journals come in six color options and you can customize each with a different name – special for each bridesmaid! 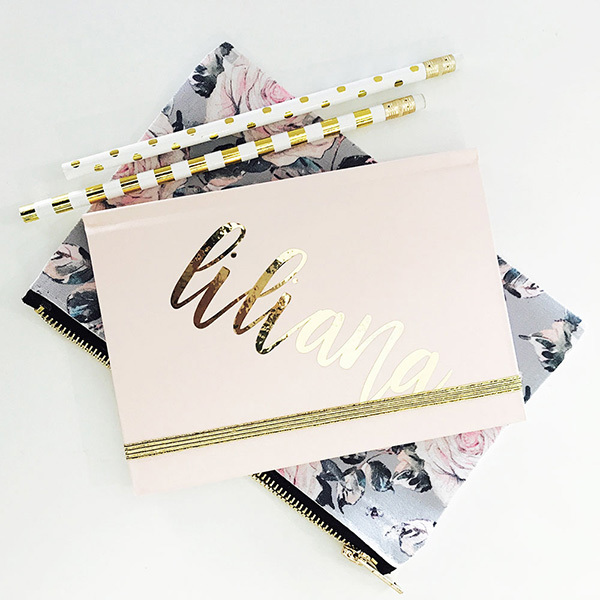 Your bridesmaids will love being able to keep track of all the wedding planning in their handy personalized notebook. In addition, they can continue to use them long after your big day as a planner, diary or for shopping lists. Add our beautiful glossy monogram pens for a complete look. 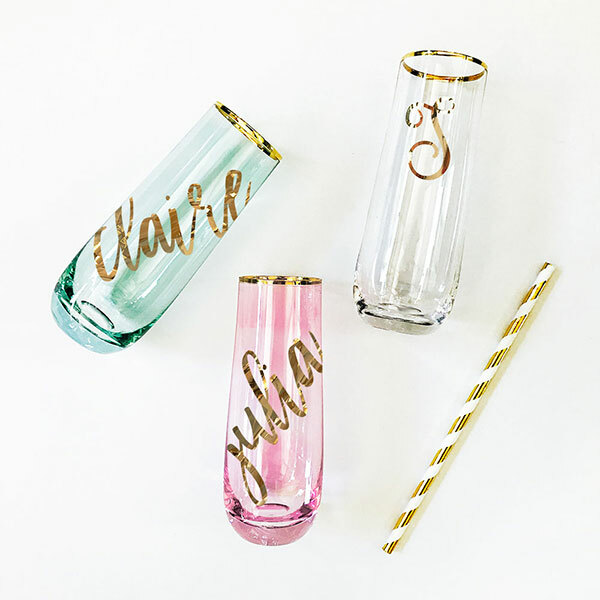 Finish off your bridesmaid gift box with cute personalized stemless glasses! Choose from mint, pink or clear glasses and add a personalized name or monogram of your choosing in shiny gold vinyl. Add a mini champagne bottle, cheers stirrers, and gold foil straws for a complete look. Additionally, you can take them to your bachelorette, use them with your bridal party in getting ready photos, or put them out for your mimosa bar at your bridal shower!